Earlier this year we covered Vulcain’s new Cricket Nautical Seventies Limited Edition model which paid homage to a very funky version of the Cricket. 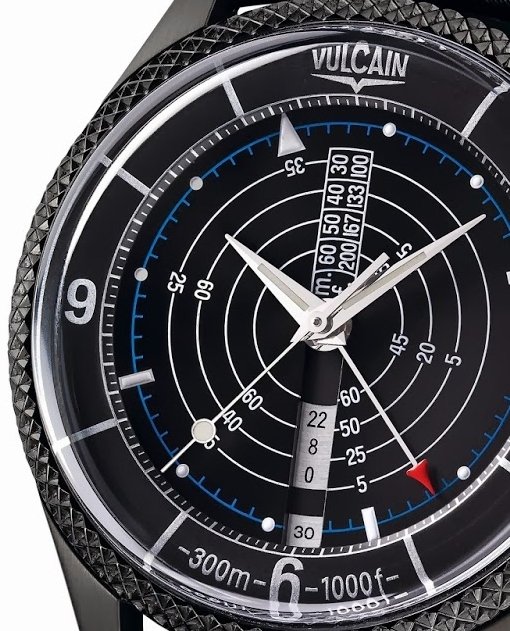 Vulcain have just released another new model, this time paying tribute to its 1961 Nautical watch – the Cricket Nautical DLC Limited Edition (100 pieces). 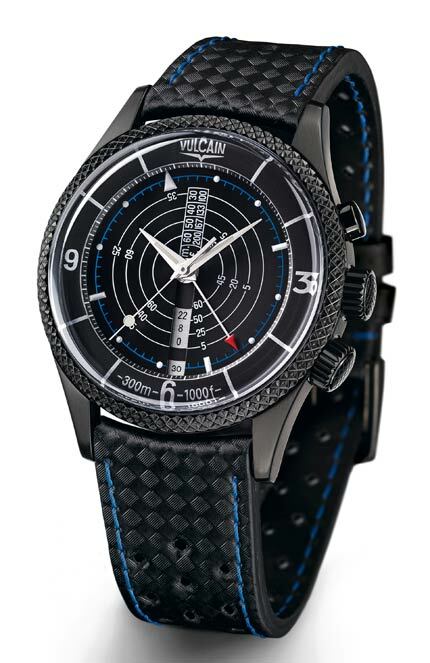 The new diving watch features the DLC (Diamond-Like Carbon) coating, which is approximately 5,000 Vickers (stainless steel has about 200-240 Vickers and Sinn’s tegimented steel, 1,200 Vickers). The charcoal grey DLC case is a comfortably sized 42mm case with a thickness of 17.3mm and has a black knurled bezel. There is a triple case-back which serves as a resonance chamber and enables underwater use of the alarm function. The alarm is reputed to last for 20 seconds, and with a water resistance of 300m, there are opportunities for this to be tested. As for the dial itself, its dominant feature is a decompression table indication and 60-minute graduated rotating inner bezel ring that is activated by a screw-locked crown at 4 o’clock. In keeping with the ‘homage’ part of the model, this is all covered by Plexiglas. Inside is the manually-wound Vulcain Calibre V-10, with 18,00 VPH and a power reserve of 42 hours. It comes on a rubberised waterproofed black leather strap with blue contrast stitching which has a DLCd pin buckle. In terms of tribute watches, my vote goes to the Nautical Seventies Cricket model rather than this one. I don’t mind a bit of DLC in my watches, but for this new model, I am not entirely certain that it works for me. It has made the watch funky and modern and very much more durable, but there’s something about aesthetic fidelity to an original watch in re-issues and homages that can be more appealing than the use of materials to ‘modernise’. are there any AD in Australia?